You can clean a kiddie pool without the use of harsh chemicals. All-natural cleaners work to remove algae stains and scum buildup without adversely affecting children's skin or the environment. Kiddie pools come in hard plastic and inflatable varieties. Each of these types comes in different designs. 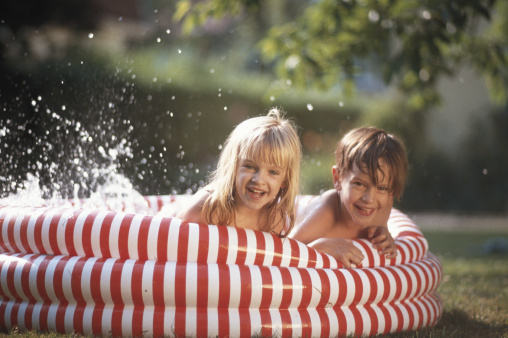 The design of your kiddie pool can play a role in how you go about cleaning the pool. Kiddie pools with seams are more difficult to clean than pools without. Cleaners shouldn't diminish the lifespan of your kiddie pool. Mix baking soda with water to form a paste, and apply the paste to the kiddie pool with a soft-bristled scrub brush. Allow the paste to dry on the pool sides, and rinse it off with a garden hose. The baking soda is harmless, so don't worry if a little of the paste residue remains in the pool. For tough stains you might have to spend a little extra time scrubbing. Mix 1 qt. of white vinegar with 1 qt. of water in a 2-gallon bucket. Use a soft sponge to dip in the solution, and scrub the pool with the sponge. Squish the sponge into the seams of the pool to get the hard-to-reach areas. White vinegar doesn't smell as much as other types of vinegar and disinfects as it cleans. Scrub the pool once, rinse it and scrub it again. Rinse after every scrubbing until the pool is clean again. Squeeze the juice out of several lemons into a small bucket, and pour the lemon juice through a coffee ground strainer into a spray bottle. Spray the kiddie pool with the lemon juice to get rid of any lime-scale deposits. The acid in the lemons acts as a calcium dissolving agent. Apply the juice to the pool away from direct sun to keep it from evaporating. Mist the pool repeatedly for 10 minutes, scrub and rinse.